Eliminates the $5.00 UPS "Additional Handling Charge"
For all 5 gallon open-head and tight-head steel and plastic pails. 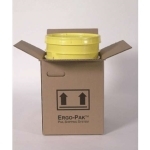 The Ergo-Pak™ Pail Shipping System eliminates the "Additional Handling Charge" imposed by UPS for unboxed pails. Specially located hand holes are ergonomically positioned on the sides of the package for easy lifting and handling. It exceeds UPS requirements and protects pails from damage. A special additional insert is used for tight-head pails.